Mumbai : Troubles mounted for KFC India after a Mumbai man claimed to have served crunchy chicken wings with live maggots inside them. Datta Salve posted pictures of his food and a copy of bill which were shared massively by most of the people on social media. After facing a lot of flak, KFC has now released a statement rejecting claims made by Datta Salve. They explained why the claims cannot be true. 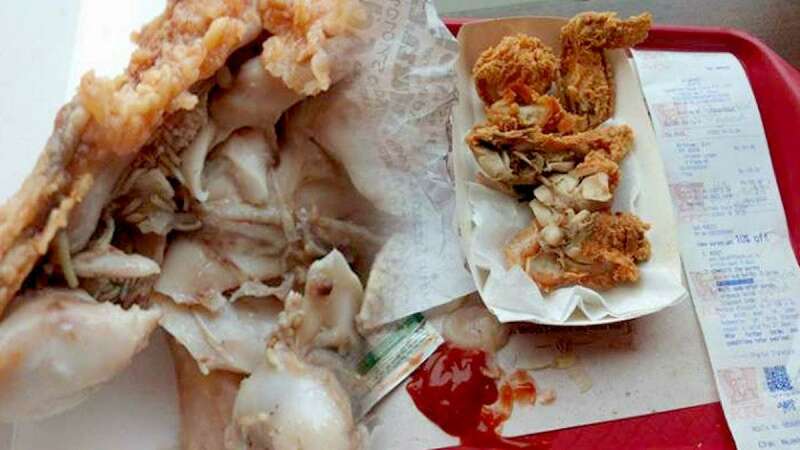 According to the statement, the chicken wings are cooked under an extreme temperature of up to 170 degree celcius which is more than enough to kill any living insect inside the food; also the product goes through 34 security checks before it is served to the customer. The statement reads, "KFC India is firmly committed to providing the highest level of food safety to our customers. We have been notified of this issue and are investigating the same. Even in theory, the presence of such foreign objects in our chicken is impossible, as each piece of chicken at KFC India is manually hand-breaded in our restaurants before being cooked at a minimum of 170 degrees Celsius. Additionally, from the suppliers’ farm to the customer, KFC chicken goes through 34 quality checks. Customers are welcome to walk into our restaurants across India, and ask for a kitchen tour, to see for themselves the stringent quality and hygiene standards that we follow." As per information provided on Facebook, the incident happened on October 1 ,2018. A similar incident was reported in Australia way back in March 2003.